SAN DIEGO (2-24-17) — Grossmont College sophomore center fielder leadoff batter DAVID MALDONADO came out swinging like a clean-up hitter as the Griffins clipped San Diego 13-9 on Friday (Feb. 24) at Morley Field. Maldonado, from Temecula Valley, was almost untouchable with his 4 hits and 7 RBI. He came up a single short from hitting for the cycle, but came through with a 4-for-5 effort, 7 RBI and 2 runs scored. He slashed a home run, 2 triples and a double. ROBERT BOSTEDT was 2-for-5 with a double and an RBI. JUSTIN BURKEY was 2-for-4 and had 2 RBI, and TREVOR BEARD drove in one and JALE SIM plated another. On Saturday (Feb. 25) the Griffins tied the Long Beach Vikings in a game that was halted after 11 innings. Those who would like to guess should know that Maldonado was 1-for-5. After going 2-for-4 against San Diego, Burkey was 2-for-5 with an RBI against Long Beach City. The game was halted by darkness. The Griffins are 6-5-1 after they defeated San Bernardino in the conference opener on Tuesday by the score of 7-2. Grossmont is 3-0-1 over its last four games. The Griffins face San Bernardino again on the road today (Thursday) at 2 p.m. before returning home to play them on Saturday at noon. Robert Boste singled up the middle, RBI; David Maldon scored. Justen Burke singled to right center, 2 RBI; Niko Navarro scored, unearned; Noah Strohl scored. David Maldon homered to left field, 2 RBI; Jale Sim scored. Jale Sim singled to right center, RBI; Trevor Beard scored. Anthony Warn tripled to right center, RBI; Ernesto Parr scored. Niko Navarro singled through the right side, RBI; Noah Strohl advanced to second; Robert Boste scored, unearned. Trevor Beard singled through the left side, RBI; Niko Navarro advanced to second; Noah Strohl scored, unearned. David Maldon tripled to right center, 3 RBI; Jale Sim scored, unearned; Trevor Beard scored, unearned; Niko Navarro scored, unearned. 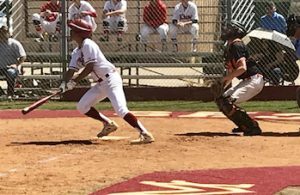 Blake Newman singled to center field, RBI; Calvin Gours advanced to second; Frank Lopez advanced to third; Anthony Warn scored. Cesar Fitch grounded into double play ss to 1b; Blake Newman out on the play; Calvin Gours advanced to third; Frank Lopez scored. Wyatt Logan singled to center field, RBI; Calvin Gours scored. David Maldon tripled to center field, 2 RBI; Jale Sim scored; Michael Diff scored. Adam Guarrac advanced to second on a wild pitch; Anthony Warn advanced to third on a wild pitch; Ernesto Parr scored on a wild pitch. Ernesto Parr flied out to cf, sacrifice fly, RBI; Conner Nelso scored. Anthony Warn singled through the right side, RBI; Addison Hull advanced to third; Kody Lewis scored. Kody Lewis singled through the left side, RBI; Conner Nelso scored. Cesar Fitch hit by pitch, RBI; Brendan Gerb advanced to second; Anthony Warn advanced to third; Ernesto Parr scored. A. Jaekel reached first on a throwing error by ss; J. Mayeda advanced to second; A. Monroy scored, unearned. Z. Martinez singled, bunt, RBI; V. Stammler scored. J. Gotta singled up the middle, RBI; V. Stammler advanced to second; T. Wilber advanced to third; A. Jaekel scored. Z. Martinez singled to right field, RBI; J. Gotta advanced to second; V. Stammler advanced to third; T. Wilber scored. I. Konek walked, RBI; Z. Martinez advanced to second; J. Gotta advanced to third; V. Stammler scored. A. Monroy flied out to cf, sacrifice fly, RBI; Z. Martinez advanced to third; J. Gotta scored. M. Diffley homered to left field, 2 RBI; J. Burkey scored. J. Sim homered to center field, RBI. N. Strohl singled to center field, RBI; R. Hernandez advanced to third; D. Maldonado scored. T. Beard flied out to cf, sacrifice fly, RBI; J. Burkey advanced to third; N. Navarro scored. J. Burkey walked, RBI; N. Navarro advanced to second; N. Strohl advanced to third; R. Bostedt scored.